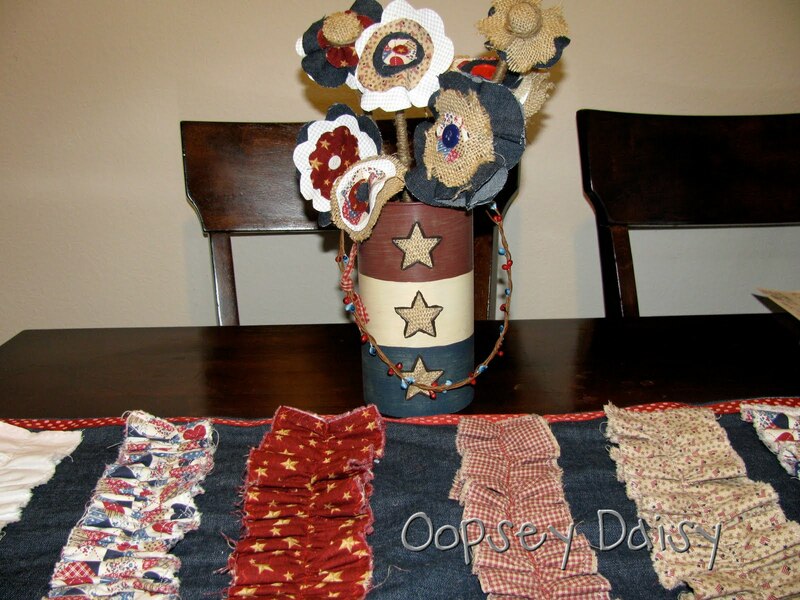 Remember my ruffled denim table runner?? 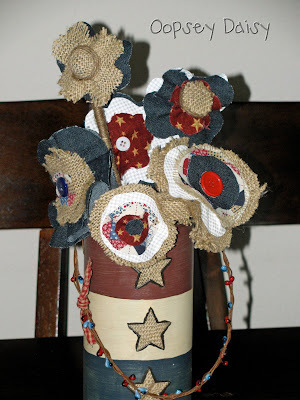 Well, I had plenty of red, white, and blue fabric scraps left over. 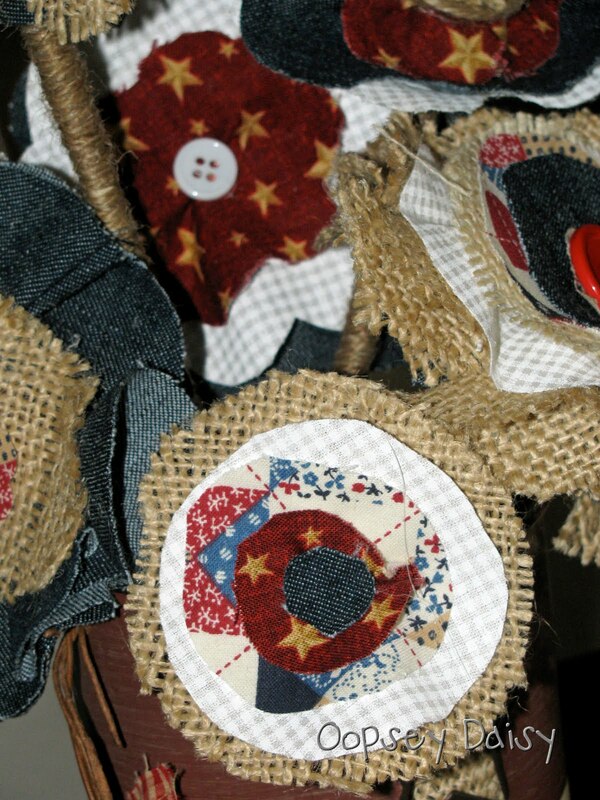 Considering the season, I knew I needed to bust out these scraps and create something pretty with them! I feel so frugal when doing a project with scrap fabric. 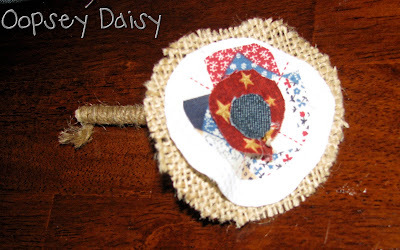 There have been so many cool flower tutorials out there, so I used some new techniques from a few to create some just plain purty patriotic flowers! I used all kinds of denim, burlap, and fabric scraps... a little twine... and some buttons. My hot glue gun and I became friends, and with barely any burns, I layered up these little beauties! 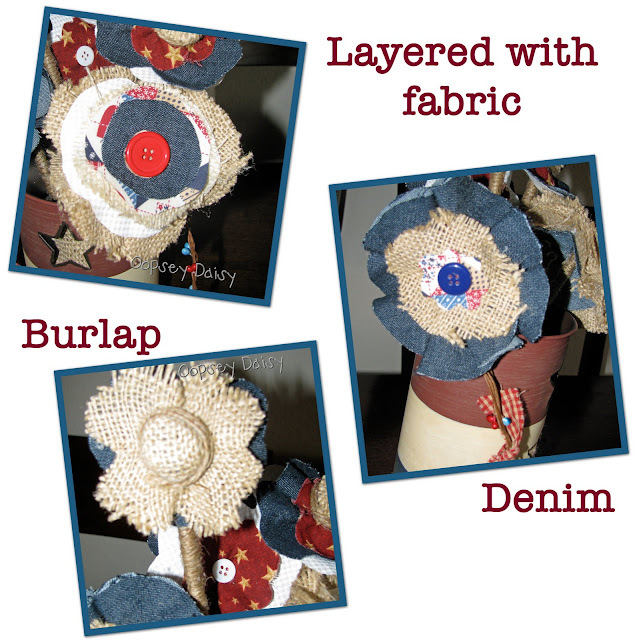 I love this project because it combines so many of my favorites... denim, burlap, flowers, and the 4th of July!! And it matches my table runner perfectly! PS Just after taking pictures, I found the perfect wooden tray to put the can on. It's a lovely finishing touch! Have a happy Monday, my friends! Adorable! The flowers look so cute. I think your runner looks great too! Ha! I saw these over at a linky party and went nuts over them. Should have known they were yours! They look fantastic! This is just too cute! Wish I weren't n the process of moving so I could make some decorations for the 4th. I guess there is always next year! I will be linking to you later in the week! Those are so cute, great job!! 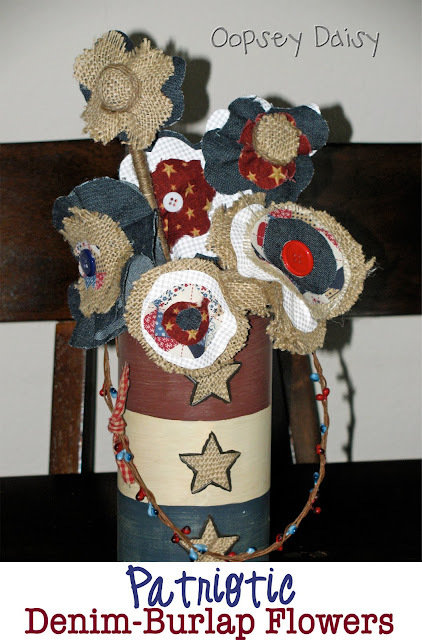 What a fun Patriotic Decoration! I love it. I absolutely love love love this!! 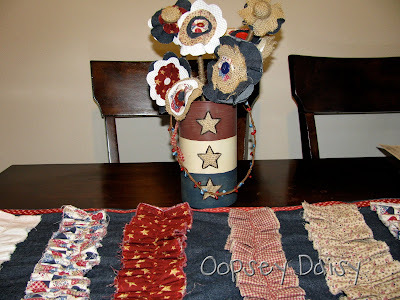 I am in love with this AND your fun table runner! Oh Goodie! Another great project! And burlap is so 'hot' right now. Hope you'll link up again this Thursday @ Fab Finds for the Fourth! So cute! Love them! Thanks for linking up to Mad Skills Monday! 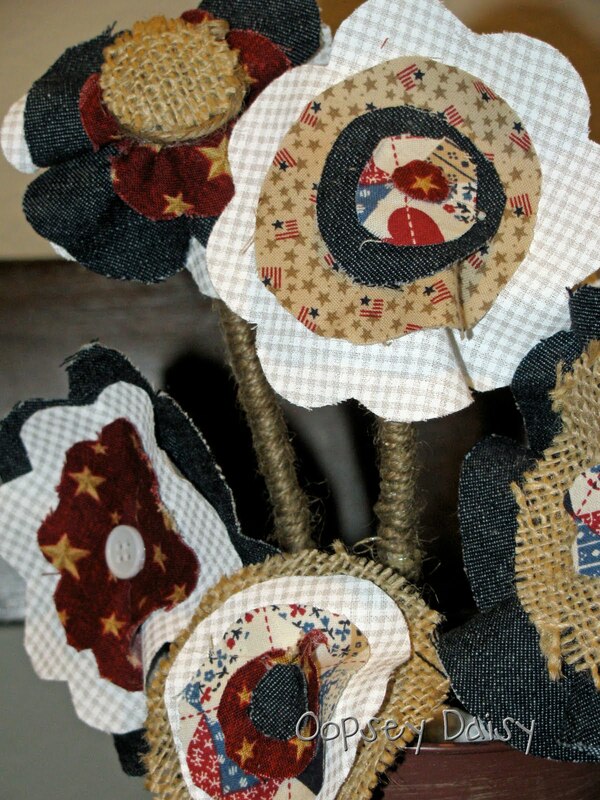 Love the flowers…they look super cute. How stinkin' cute! I love them! Thanks for linking them up to Hoo's got talent! These are adorable!!! I want to try it!! You already know I think this is adorable. I think it is great. 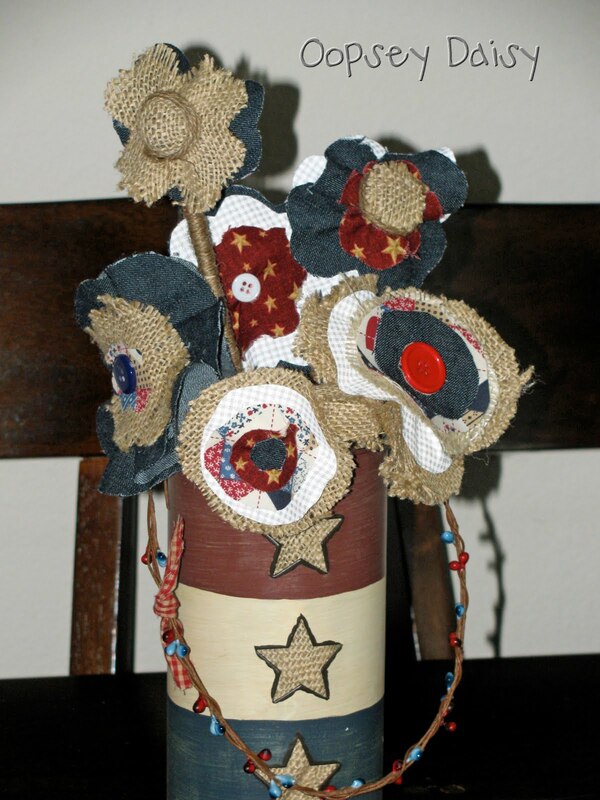 It is a great decoration for the 4th of July. I will be linking to your wonderful decoration. These are so adorable! Thanks for sharing.